Hey there! I have been seeing curiosity strikes on my Maxi-Peel Exfoliant review, I am not paid nor given free products to advertise anything, but this product is one of the main stays in my beauty routine for about a few months already. Its something I come back for every now and then, its the only product which calms my sudden breakouts. I know we've all heard our share of horror stories of Maxi-Peel users who experienced disaster. It works wonders when used correctly. After 1 month of rest period, you may use exfoliant solution again for a maximum of 2 months then 1 month rest. The cycle goes on and treatment will end once you've achieved the smooth skin that you desire. After which, you may opt to stop using Maxi-Peel Exfoliant Solution but keep on using the maintenance products like Maxi-Peel Facial Wash or Maxi-Peel Exfoliant Scrub, Maxi-Peel Concealing Cream, Maxi-Peel Sunblock Cream, Maxi-Peel Facial Cleanser and Maxi-Peel Moisturizing Cream. I bought Maxi-Peel Facial Wash in sachets, it was currently on sale. I was thrilled on the facial cleanser that I bought the large bottle in pore minimizing pink variant. Yeesss something for the pores! During the day I use Maxi-Peel Facial Wash, cleanser and my own sunblock (its from some other brand). I did it for around 3 days but I suddenly broke out. I slowly incorporated Maxi-Peel again in my routine but I realized that the reason for my acne breakout was the Maxi-Peel Facial Cleanser. I really thought my skin would be okay with it simply because it was from Maxi-Peel. I had acne on my chin and cheeks after using it. I stopped and reused it again, and surprise surprise, more pimples! No improvement on pores as well, I felt bad for buying a big bottle... Lesson learned try the smaller size before you buy a big version of any beauty product. The facial wash on the other hand didn't broke me out. As an alternative to the original regimen I used my Silkyskin makeup remover and Maxi-Peel facial wash instead. Sometimes I also use honey as a face mask and moisturizer (talking about going natural!) I used less products to make sure my skin won't be irritated and that means less makeup too. What works on me may not work on you and vice versa. Right now I will soon be using Maxi-Peel again, hopefully I won't have too much purging. 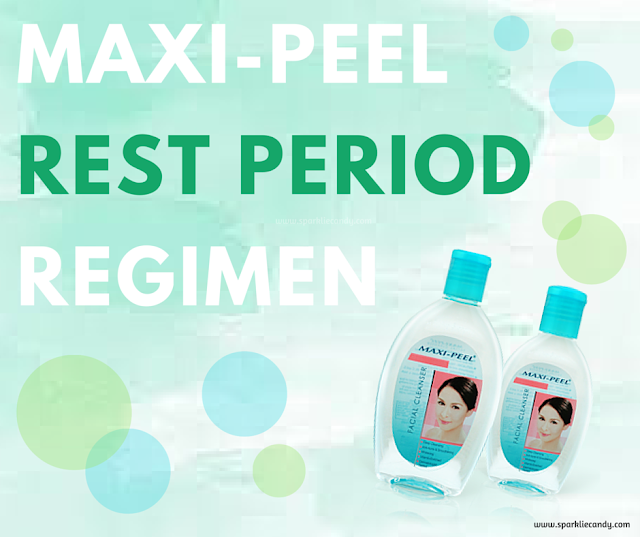 Do you also use or have you tried Maxi-Peel products? What is your current skincare regimen? I would love to read your thoughts in the comments! i agree, their cleanser broke me out too. but the maxi peel exfoliant is AMAZING! Same here too, maxi peel facial cleanser broke me out. Content and Images in posts are owned by www.sparkliecandy.com unless otherwise stated. Powered by Blogger.